They're back! 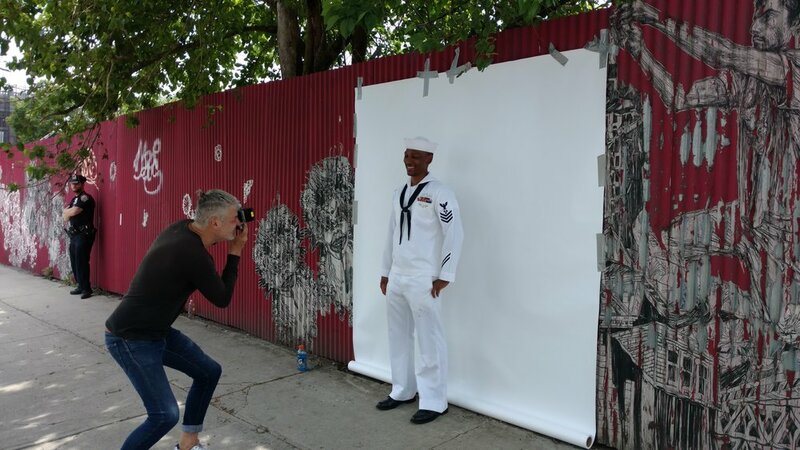 Last year was the first year that Fleet Week ships docked at the Brooklyn Cruise Terminal in Red Hook, and two Navy ships are coming this year. 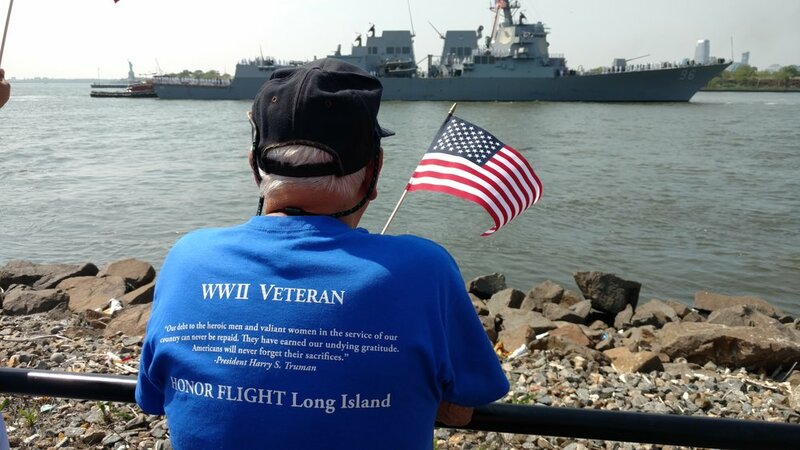 The ships arrive in NYC on the afternoon of Wednesday, before Memorial Day Weekend, and are open for FREE tours on Thursday, Friday, Saturday, Sunday and Monday, May 25-29, 2017. Tours start at 8:00 am, and the last tour starts at 4:00 pm, and the ships close at 5:00 pm. 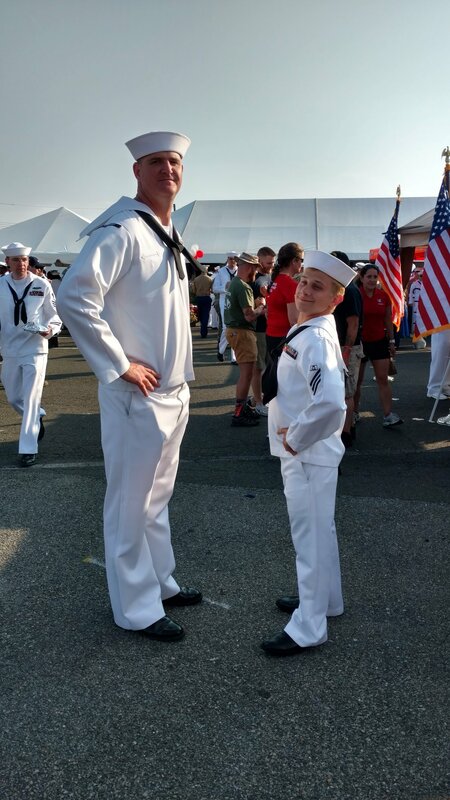 Fleet Week rules on what you can't bring & need to bring, etc. See their FAQs for what you need to have (IDs of people over 18) and can't bring aboard: strollers (leave them on the pier), bottles, cans, knives and more, and what you should avoid (high heels, sandals, open toed shoes and more). To get to the Brooklyn Cruise Terminal inside the Atlantic Basin facility, follow the same directions to get to our ship MARY A WHALEN on Pier 11, and continue past her (she's big and red and on your right) just before the cruise terminal on Pier 12. It is better for lots of reasons, if you are biking, walking, or taking public transportation, to enter the pedestrian/bike gate at Pioneer Street and Conover Streets; Google map that as next to 159 Pioneer Street. Cars enter at Bowne & Imlay Street. Parking: Lots of free parking! 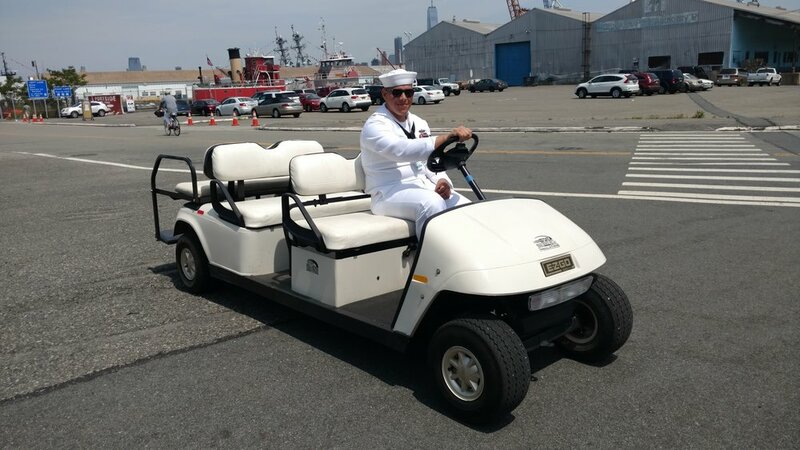 A Navy golf cart valet can take you from your car to the ship check-in. Visit the Red Hook neighborhood, home to great restaurants, bars, art and parks -- and a local music scene! There is live music in many of the bars, especially Sunny's and Jalopy and Bait & Tackle and Rocky Sullivan's. Rocky's is at the corner of Beard and Dwight. There is great ship spotting of local ships and lots of local maritime history, all of which PortSide has mapped in our Red Hook WaterStories guide. More on that below. As of June 1, there will be a NYC Ferry terminal between our ship and Pier 12, so you return easily and often to this great neighborhood! Saturday, June 3, our ship MARY A. WHALEN is open for FREE TankerTours on the occasion of her 79th birthday from 10:00am to 5:00pm. USS MONTEREY (CG 61) : "Rough in Battle and Ready in Peace"
USS SAN JACINTO (CG 56) : "Victory is Certain"
visited the ships in Red Hook last year, so the lines were long in the afternoon. Better to go in the morning.